Left: Fay Graham and Kathy Chase received life membership at the 50th anniversary celebrations. RUBY Jensen had the honour of cutting the cake marking the Toowoomba Embroiderers' Guild's 50th anniversary for good reason - she has been a member since it started in 1969. Ruby, 84, said she had enjoyed both the stitching and the friends she had made over those years. Although her mother died when Ruby was just seven years old, she remembers the beautiful work she used to do. Having learnt her first stitches from her cousin as a schoolgirl, Ruby said it was a shame that more people didn't have the time today to become involved in embroidery and other needlecraft. Also a stalwart of the CWA, which she joined in 1970, Ruby is happy to be able to pass on her embroidery skills and is a dab hand at knitting and crochet as well. President Mary White presented Ruby with a 50-year membership badge at the guild's golden anniversary lunch, with Kathy Chase, Fay Graham and Elizabeth Schmidt (in absentia) given life membership. Publicity officer Helen Smith said about 60 people had attended the gathering at the Highfields Cultural Centre. Although the group's 110 members are predominantly retired, they are reaching out to those still working by holding monthly Saturday classes, and are happy to welcome new members of all ages. "For me, because it's usually fine work, you have to concentrate and focus, and that's very relaxing because you can't be thinking about what jobs you have to do, or what to cook for dinner...," Helen said. "And it feels good to be able to make something ... and make something beautiful. "A lot of people's mothers and grandmothers did finework or fancywork as they called it, so it's often continuing a family tradition." Helen said she had learnt embroidery as part of home economics at school, but didn't get back to it again until she was in her 40s. The Toowoomba guild holds two major workshops a year, as well as Stitch of the Month biannually to teach or perfect particular stitches or styles, with internationally renowned embroiderer Alison Cole recently teaching gold work for the golden anniversary. 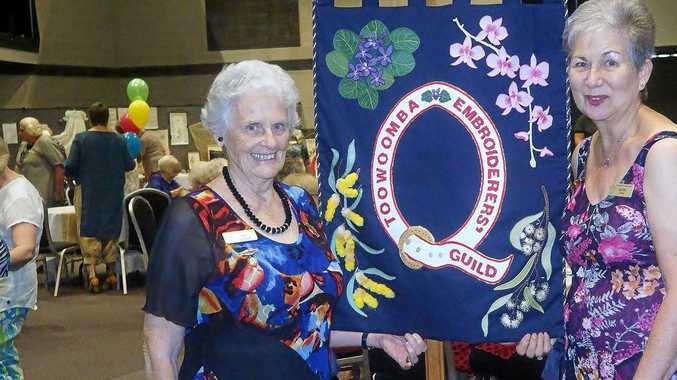 Helen said the guild would again be joining forces with local quilters for a Quilts, Stitches and Textile Trail during the Carnival of Flowers, attracting craftspeople from across southeast Queensland and northern NSW. The guild meets at St David's church hall, Toowoomba, from 9am-2pm each Tuesday and every fourth Saturday, as well as at Highfields Cultural Centre each Thursday from 9.30am-12.30pm. To learn more about the guild, phone Mary on 4635 2810 or Kathy on 0400 380802.